A quality air filtration unit brings needed control and efficiency to your laboratory environment. However, if proper cleaning procedures are not followed, your accuracy may be faulty and unreliable. Make sure your lab results continue to provide safety and accuracy. Run the cabinet for at least 15-20 minutes prior to cleaning. Wear sterile clothing and cleanroom gloves. Always use lint-free cleanroom cloths. Use different cloth (or alternate surfaces of a folded cloth) for each different wall/surface of the unit. Use 70% isopropyl alcohol for cleaning solution. Always clean from back to front, top to bottom. Beginning in a top back corner, wipe down entire span of wall surface with long, side-to-side motion. Overlap each swipe by at least 25% coverage. Do not attempt to clean the HEPA filter. Doing so could damage the media. Clean the ceiling of the unit first. Clean the back wall (of a vertical laminar flow hood) next, going from top to bottom. Clean the sides (swiping from top to bottom in overlapping lines). The work surface should be the last surface cleaned, beginning in the back and ending at the front of the unit. Following these simple steps for cleaning a laminar flow hood will ensure your unit stays sterile and produces the accurate results your work demands. 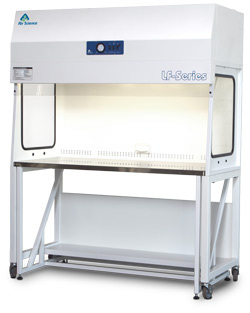 More information concerning the differences between vertical and horizontal laminar flow hoods can be found here. To speak to a trained technician about our available air filtration units, call us today at 800.306.0656.